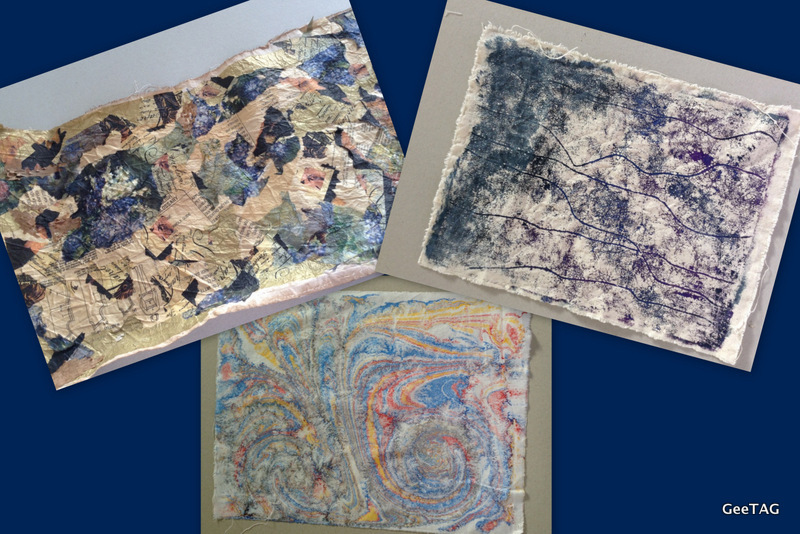 We have had some great plays on fabric recently at our GeeTAG group. Our fifth Saturday play day at Shearer’s Arms studio has enabled us to spend extended time on messy play. At our April messy day we tried lino and meat tray prints, stencilling using brusho, printing with a variety of materials, marbling on fabric, flour paste resist and a technique using textas and methylated spirits to colour fabric. My marbled fabric, centre bottom, was a little grainy as it was the first pull of the ink off the carrageenan. After a couple of prints the clarity improved. 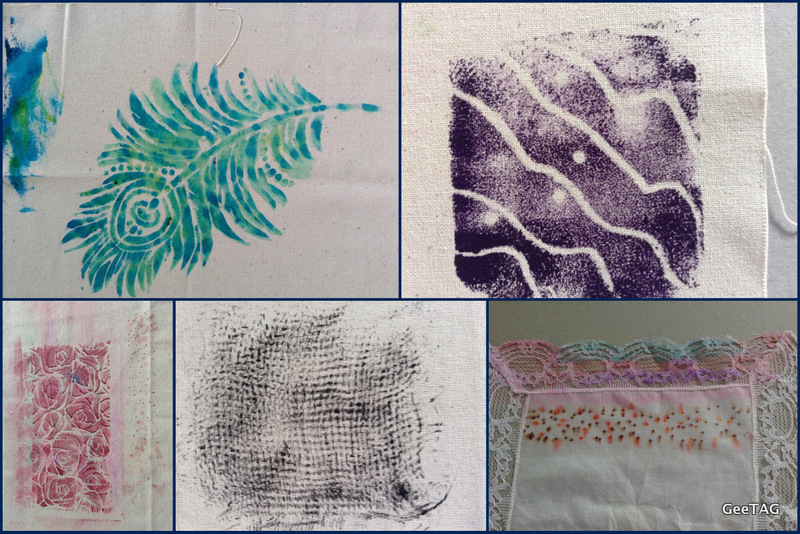 The flour paste resist is something I will experiment with more (right top) and the top left was our regular Saturday meeting, topic: Stitch on paper, where we made paper fabric using a variety of papers pasted onto calico. I also aged my paper with a few dabs of walnut ink when I got home. Our March meeting was nuno felting and I made the piece above for the front cover of my book, the 2017 “Choose your own adventure’ project for GeeTAG. 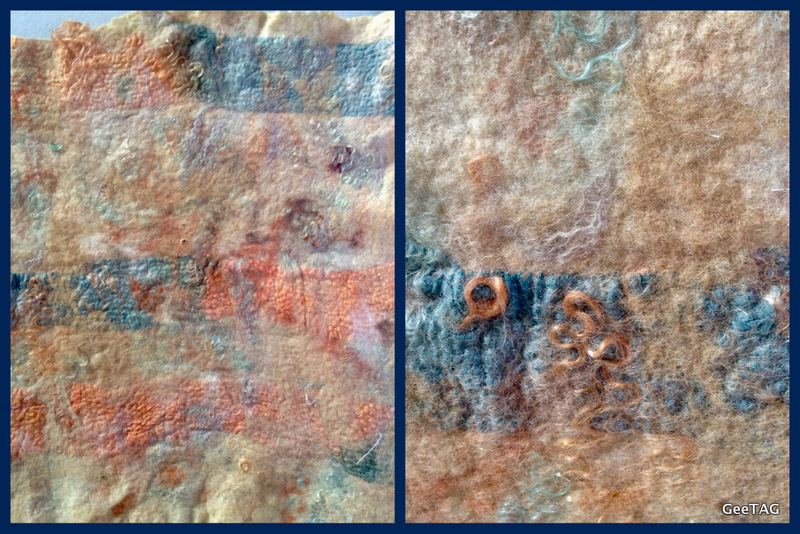 I have just dyed some more fleece in walnut ink to make another piece for the back cover. Above you can see a glimpse of the gum nut panel I have been working on for Dijanne Cevaal’s ‘Aussie Bush’ project. I have added some organza over the design, framed it with some of my natural dyed, printed silk, FME’d and will add some hand stitch elements. 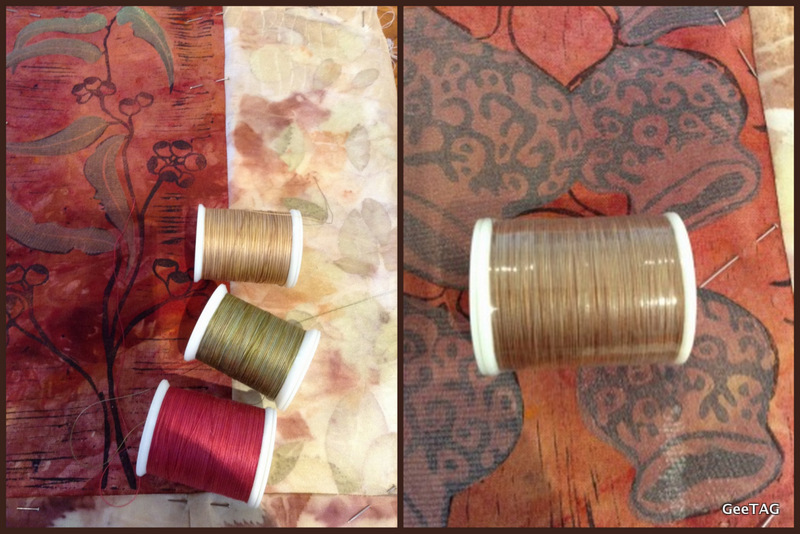 I dyed some silk in walnut ink for the binding but it is not as dark as I would like so I may re-immerse that again to get a nice dark frame for the work.